MinView is a web-based service provided by the Geological Survey of NSW, a unit in the Mineral Resources branch of the *Department of Trade and Investment, Resources & Energy. MinView enables users to interactively view, search and download historical and current geoscience and exploration title information via the Internet. The MinView Entry Portal provides entry points for users requiring access to exploration information about Minerals, Coal and Petroleum; to query Titles information; lodge Mineral Exploration Licence applications; request Exploration Licence expiry reminders and; download related information. The following link lead to the NSW Government minview site. If you wish to check on csg info select the petroleum tab. 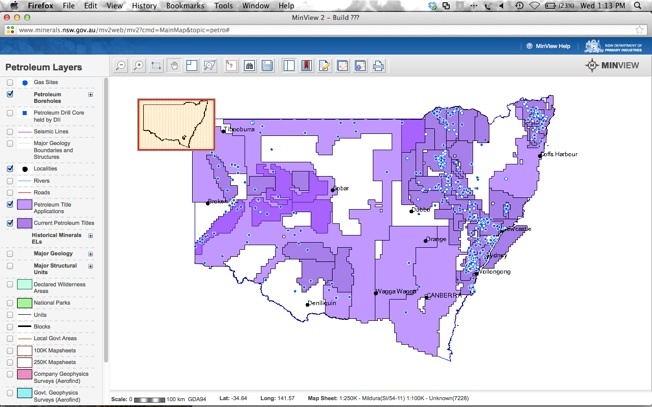 You can then select a variety of layers on the map of NSW, i.e wells, current leases, pending leases etc etc. The picture below shows exploration leases and pending lease applications for NSW Sept 2014.